Repair corrupted chipsbank USB 2.0 flash drive .Download Flash Disk Manager v1.5.1 software and repair chipsbank CBM2090 and chipsbank CBM2091 chip controller . 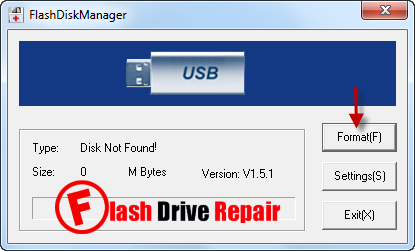 FlashDiskManager v1.5.1 is designed to repair and fix corrupted chipsbank USB 2.0 flash drives that have the following chip vendor models "CBM2090 ,CBM2091" .Flash Disk Manager v1.5.1 can format flash drives with low level format .If you face format troubles with your flash disk and you can't format your flash so you can use Flash Disk Manager v1.5.1 tool. 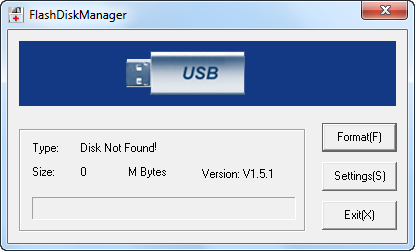 Download Flash Disk Manager tool from the download links in the bottom of this article . Insert your corrupted Chipsbank flash disk to your computer . Open FlashDiskManager.exe and you will see your flash information appears on the software . To make low level format for your flash disk , please click Format . You can modify format settings by click on Settings . Don't interrupt flash drive during flash drive firmware update "formatting process" . PC do not detect my flash drive. Also tried UmptoolV1.9.32, ChipGenius_v4_00_0022 and FlashDiskManager v1.5.1. Nothing works.